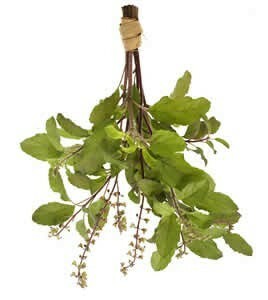 In India, holy basil is known as "tulsi," which translates as "incomparable one." The plant, which is considered sacred, is used extensively in religious ceremonies and is believed to protect any home where it is grown. According to Ayurvedic tradition, tulsi is one of the best herbs to prepare the heart and mind for spiritual practices. But the benefits don't stop there. Holy basil has been used extensively for its medicinal values by a number of cultures. More frequently consumed in India than coffee, holy basil, made into tulsi tea, is an energizing drink that is most known and most often used to reduce cortisol or stress levels in the body, it is also used to treat lung and heart problems, digestive disorders, mental fog, colds, headaches, inflammation and other ailments. Chinese medicine uses holy basil for stomach spasms, kidney conditions, to promote blood circulation, and to treat snake and insect bites. Though I do use holy basil myself for stress symptom relief, and can say that it is effective, this article isn't about the medicinal uses but about how to grow the plant. If you want to learn more about the medicinal uses, and how it serves to improve health and well-being, do a Google search and you'll find a plethora of information. Holy basil is very easy to grow. As with other basils it is an annual herb that cannot withstand frost and will only thrive with night temperatures above 54°F (12.2°C). This plant is usually grown as an annual in garden beds outdoors but can be successfully grown indoors throughout the year as well. It can also be grown outdoors in containers which can be brought indoors when temperatures are forecast to drop below 54°F. 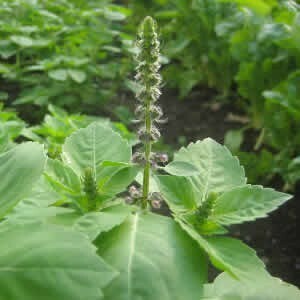 Holy basil can be grown by sowing seeds or by purchasing etsablished plants. I only grow a couple plants each year so purchase these from a local nursery and garden center. If you're local nursery does not offer the plant, you can purchase plants online year round. I provide a link at the bottom of this article for an online source. If you choose to grow plants from seed, just make sure to purchase seeds from a reliable source. I've heard that some sources are not shipping true holy basil seeds but some other variety, and there is a difference! 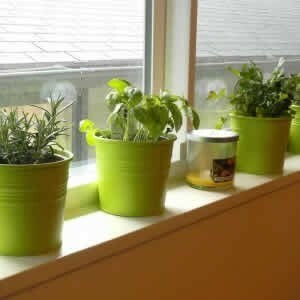 Because the plant requires at least 6 to 8 hours of sunlight a day, you'll want to make sure to set the container on a sunny windowsill. Indoor temperatures should be at least 70°F (22°C) during the day. I use an oblong or rectangular container that is 12 inches or so in length with a width of about 6 inches and a depth of at least 4 inches. This container fits perfectly on my windowsills. You can use a smaller container however the larger the container the more soil for the roots. Make sure to use a container that has drain holes and set it on a tray or saucer. If you have trouble finding container-grown plants you can grow plants from seed. When growing holy basil indoors, seeds can be sown at any time of year. If sowing inside to then plant outside, you can sow the seeds in late winter in small pots and then transplant seedlings to garden beds when nightime temperatures are consistently above 54°F (12.2°C). Fill your pot(s) with an organic potting mix. Sow enough seeds for a few plants in each pot. Cover the seeds with about 1/4 inch of soil and firm gently. Water the soil enough to keep it damp but not constantly soggy. Basil seeds usually germinates in 7 to 14 days at temperatures around 70°F (22°C). Once the seedlings have developed two pairs of true leaves, thin out the weakest seedlings, leaving just the strongest plant in each pot. Whether growing holy basil in outdoor garden beds or containers, select a garden spot that receives at least 6 to 8 hours of direct sunlight per day; the more sun the better. Work an aged, organic compost into your garden soil to a depth of 12 inches. Whether planting established container-grown plants or by seed, wait to plant holy basil outdoors until after the final spring frost and when nightime temperatures are consistently above 54°F (12.2°C). When planting outdoors by seed, press seeds 1/4 inch deep in the soil so that they do not float away when watered. Cover the seeds with soil and water only enough to keep the seed bed damp, but not constantly soggy. Seeds should germinate within 14 days or so. Once the seedlings have developed two pairs of true leaves remove smaller plants so that the remaining plants are separated at 18 inches apart. Wait until nightime temperatures are consistently above 54°F (12.2°C) to sow seeds in containers outdoors. Fill your pot(s) with an organic potting mix or a mixture of potting mix and potting soil. Sow enough seeds for a few plants in each pot. Cover the seeds with about 1/4 inch of soil and firm gently. Water the soil enough to keep it damp but not constantly soggy. Once the seedlings have developed two pairs of true leaves, thin out the weakest seedlings, leaving just the strongest plant in each pot. Watering: Because basil are subject to "damping off" disease triggered by too much water, water plants only enough to keep the soil damp or moist but not constantly soggy or wet. Feeding Plants: I always use a granular organic plant food to feed basil and other herbs. If using a water-soluble plant food feed once every other week or so. Follow instructions on product label. Mulch: When the seedlings are 3 inches tall, you can spread coarse mason sand to a depth of 2 inches over the soil around the plants. The sand mulch reduces weeds, controls moisture and moderates temperature fluctuations. Pinching: When growing from seed, pinch back or clip off the central stem of each holy basil plant about six weeks after the seedlings sprout. Leave only two leaf sets on each stem. Doing so encourages the development of leafy lateral branches. Harvesting: Wait until your plant(s) flower because the flowers hold more of the potent essential oils than the leaves. When flower spikes form, snip the entire stem (leaves and all) off to a point just a few inches in height; the plant will continue to send up new shoots from the area you cut. Tie small bunches of the flower spikes at their base with string and then hang them in a warm, dark, dry, well-ventilated area such as in a garage. Alternatively, you can spread your cut flower spikes on an old window screen that you prop up on a table with bricks or pieces of wood. Check your holy basil cuttings every day to monitor the drying progress. When it feels crunchy, take it down and strip the dried foliage off the stems. Depending on the weather, this will happen within 1 week or less. Store your dried holy basil in tightly sealed glass jars or plastic zipper bags, which you can keep in your refrigerator or freezer to ensure freshness. Not knowing what Ayurvedic tradition was I did some quick reseach and found some interesting information regarding the science of Ayurveda. The word ayurveda means the science of life. It is the science of healing through the use of herbs and natural means. This healing system was formulated by an ancient Hindu priest back to 400 years B.C.. Ayurveda is part of the vedic sciences that include yoga, meditation, astrology, and Ayurveda. Ayurveda includes herbal suppliments, the right kind of diet, and the right kind of living. As this article notes, much can be found regarding this science of Ayurveda and the benefits of the Holy Basil. Thanks Brent, will definitely look forward to growing some of my own. Hey John - I already garden and eat mostly organic. Am gonna start doing some extensive research on Ayurveda so more articles on medicinal plants should be coming. 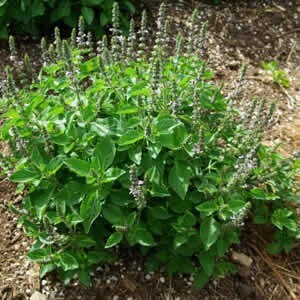 The holy basil is very easy to grow...easier than sweet basil...a little easier outdoors than indoors. I use the fresh leaves during the growing season to make the tea and also dry some leaves for use during the winter. Have very little room to grow much more but hopefully can get some growing in pots. Will look forward to more articles on medicinal plants. I collected a paper bag full of holy basil leaves with intent to steep the dried herb to make tea but after reading this article I am going to have to try tea made from the flowers. However, I used a stone pestle to powder the dried leaves and it smells heavenly. I think I am going to try and use it as loose incense with heat to surround and destress myself in its aroma, a common practice in Ayurveda & the far East, from which it originates! Holistic healing is something I want to learn & practice more of. I agree with you guys, Ayurveda is extremely interesting and I hope to change it from something I simply learn about into part of my lifestyle.